Parents, take note: you'll be prowling the toy aisles this fall for interactive hamsters and mind-controlled games. The good news is you'll have more stores to choose from, and with fierce competition for your money, you might find a decent price. Toy-store chain Toys "R" Us has released its annual forecast of the hot toys this holiday season, including more traditional toys, like Fisher-Price's sniffling Little Mommy Baby Ah-Choo, and Hasbro's Nerf N-Strike Raider Rapid Fire CS-35 foam-dart gun. The list is heavy on batteries-not-included entries: Cepia's Zhu Zhu Pets (interactive robot hamsters) and Mattel's Mindflex (a game for maneuvering a ball through an obstacle course via a headset that senses brainwave activity). The list also includes the usual raft of movie spinoffs: the Just One Kiss Princess Tiana doll, based on Disney's next animated movie, The Princess and the Frog; Buzz and Woody Toy Story interactive action figures; a new Star Wars anniversary edition set from Lego; and the Transformers: Revenge of the Fallen Constructicon. Toys "R" Us expects some creative and educational toys to be hits, like the Color Me a Song game from Crayola, and Laugh & Learn Learning Farm from Fisher-Price. Among older kids, though, the list of games is heavy on electronics, including a Disney Netpal netbook computer from Asus, and Wii Sports Resort video game from Nintendo. The toy chain is putting a full-court press for this holiday; retail sales are likely to stay flat over last year's depressing 4.5 percent decline, according to consulting group Retail Forward. And many players will be fighting for a piece of the sales; Sears Holdings (SHLD) is bringing toy departments back to stores, and other mass merchants, like Walmart Stores (WMT), are focusing on toys this season. Toys "R" Us plans to open nearly 260 pop-up stores in malls and Babies "R" Us stores nationwide just for the holidays. The retailers will have to fight not only each other but a change in consumers' priorities, following last year's economic shell shock, says Mandy Putnam, VP of Retail Forward. Even though shoppers plan to spend the same amount on gifts this year as last, many consumers who only bought gifts for their kids last year are looking at things other than toys and video games this time around, she says. Retail areas where spending tanked last year, such as apparel, will recover some lost ground this holiday. "This will not be only a kid's holiday this year," Putnam says. 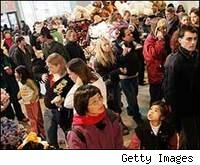 Retail Forward analysts say shoppers' spending panic has eased, so toy spending will have to compete for its share of holiday spending. And that means promotions and price cuts are likely, if those mind-control helmets don't fly off the shelves as expected. Toys R Us has released a list of hot toys for 2009. Click through the gallery to see 15 toys kids will be asking for during the holidays.